When you go to Kansas City, Kansas, you must have the barbecue! Perhaps the state’s geographic position in the Wild West days of wagon travel originally inspired the famous dishes and barbecuing method of cooking, but the sheer taste of barbecue keeps it relevant. Location: Slap’s BBQ is located at 553 Central Avenue in Kansas City, Kansas. 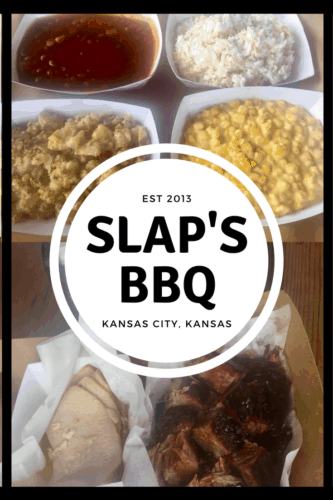 Menu: Slap’s BBQ has been in partnership with Heinz foods and the brothers are the face of Kansas City sauce for two years now. Thoughts: Three years ago, when brothers Joe and Mike Pearce decided to quit their corporate jobs and follow their barbecue passion, their mother joined them. Together, the Pearce family formed Slap’s BBQ. Life has been good for the brothers who clearly have a knack for cutting-edge business trends, unique recipes, and keeping customers happy (as their restaurant is almost always on a wait). Due to its success, Slap’s BBQ has been able to branch out, quickly. Joe and Mike also set out on the competition circuit under the name Squeal Like A Pig. Soon, the brothers found themselves cooking against the big dogs on Destination America’s BBQ Pitmasters television show. Though they did not win, they did make it to the finals and brought home several awards, with the least experience of any pitmasters there. Currently rated as 10th of 2,600 in the Kansas City Barbecue Society and the team of the year winner in 2017, Squeal Like A Pig has perfected barbecue. When I visited Slap’s BBQ, not only did the grilled meats with mouth-watering sauces knock my socks off, but the side dishes were equally as impressive. The brothers carry on the great Kansas City barbecue position with their take on one of the most notorious meals of the Midwest. Slap’s BBQ sells out so be sure to get there early! Guests order at the counter and then wait as their food is prepared. Lines are long and space is limited in the kitchen, so it may take 8-10 minutes for your order to be filled. Be patient: the hot food is definitely worth the wait. The meats reign supreme at this desirable restaurant. A variety of sauces are offered at Slap’s BBQ’s tables to spice up your plates. Burnt Ends are the most requested item and from the tangy, smoky deliciousness of the crispy pieces, I can see why. Spicy sausages, fall-off-the-bone ribs, and low and slow cooked brisket are other sure to please choices. Slap’s BBQ knows that everyone is not a barbecue fan so they offer plenty of other options such as the smoked turkey, my personal favorite. It was divine; moist and buttery. Another of my favorites was a unique restaurant find, Warm Baked Potato Casserole. Flavorful, tender chunks of potatoes tossed with cheese and seasonings that I wanted to eat every bite of! The cheesy corn, a trendy menu item I’ve been seeing around the country, ranks supreme at Slap’s BBQ. Their stellar recipe consists of cream cheese, butter, and a few other items make this comfort food concoction a real tasty treat. I loved Slap’s BBQ’s covered patio, filled with picnic tables and plenty of space to move around. Customers, mostly business folks at lunchtime, did not seem to mind sharing the long picnic tables and it was easy to strike up a conversation with others. We were all bonding over a darned tasty meal that we won’t soon forget! Melody is half of the Wherever I May Roam Blog travel writing team, along with her daughter, Taylor. She is the Southern TravelingMom and a member of NATJA and TBIN, a vetted group of influential travel writers and social media enthusiasts. She writes for Charleston Home and Living Magazine, Best of Life Magazine, Travel Guide to Florida, and various other sites and publications. Her blog has been in the Rise Leaderboard’s Top 1000 Blogs and Top 100 Twitter Sites for over a year..